I love Winter cooking. The temperature only has to drop but only half a degree and I have the soup pot on. Some of my favourite soups end up migrating into stews, with the addition of things like beef bones, lamb shanks and ham hocks to make deliciously thick and satisfying meals to fight off the cold. Cauliflowers are great at this time of year and I bought a gigantic whole one at the fruit market yesterday for $3 to make cauliflower soup. Here is the recipe from this month's Donna Hay Magazine (June/July 2010). I have included my own little twist - Garlic Sourdough Croutons. I felt the soup needed a little something extra - in addition to the added texture of the cauliflower crumbs, the croutons add a nice satisfying crunch. Over low heat, melt butter and cook onion, garlic, thyme and bay leaf until onion is soft and translucent. Add cauliflower, potato, stock and milk and cook until tender (about 30 mins on medium heat). Take off the heat and with a stick blender, blend until smooth. (Alternatively use a blender). Add cream, stir through and season to taste. In a bowl, place cauliflower, oil and Parmesan (I added 2 sprigs of thyme, stripped of leaves as well) and toss to coat. Transfer to a non-stick frying pan and cook over high heat until golden and crisp. In a bowl, place bread cubes, garlic, and drizzle enough oil to coat (about 2 tbs). Toss to coat well. Transfer to a non-stick frying pan and cook over high heat until golden and crisp. Season with salt and pepper. These croutons will dry out and crispen on cooling and will keep in an airtight container. This will yield enough for 4 generous serves. 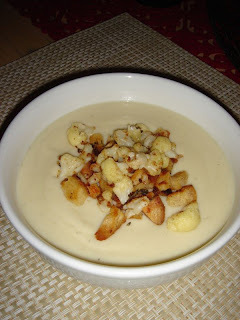 The soup has a nice creaminess and the flavour of the cauliflower is lovely and mellow, which comes from cooking it in milk. It was also nice to use my home made chicken stock! I made extra croutons as the weather now is rather cool and I am anticipating more delicious 'Stay-in' evenings, of snuggling up on the couch with a warming bowl of soup. Who am I kidding? They are just nice to snaffle up as a cheeky savoury snack!